How to update and older version of electrum on ubuntu 17? In the future, how would I go about updating electrum? What command would I use to update? Also, where are the electrum files installed that contains my private keys and wallet? how would I go about updating electrum? What command would I use to update? There is also PPA package repository, but I think they didn't update it. I've a shell script, this script check the github source, download the last version and save the backup of an old wallet. You can find it here. where are the electrum files installed that contains my private keys and wallet? On the Linux machine, there is the folder ~/.electrum which contains your wallet, configs and other. pip3 will uninstall the old version and install the new version for you. I strongly suggest installing using pip3 instead of relying on your distro's repos. 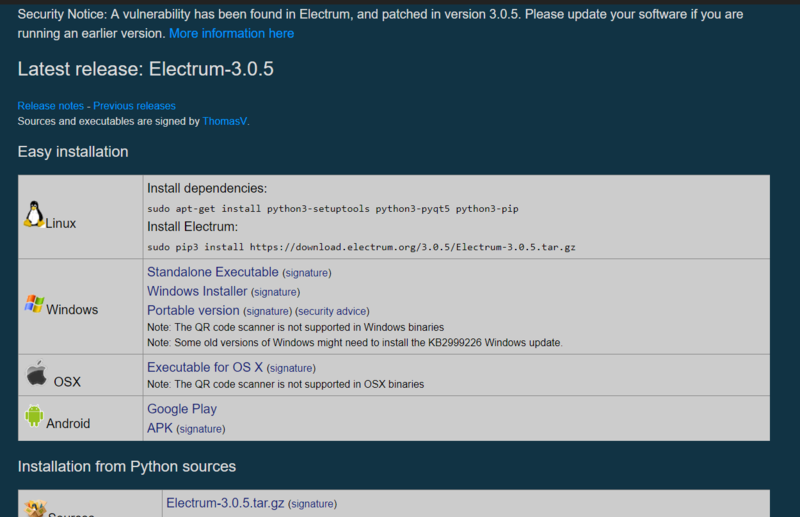 Electrum has a very fast release cycle and most distros don't keep up with the latest. Installing from source will get you the latest and greatest. I also strongly recommend checking the gpg sig before installing. This script automates all that for you. Wallet files are stored in ~/.electrum/wallets. You can also backup the file via file menu > save copy. More about backing up an Electrum wallet here. In case you are wondering wallets don't get removed when you uninstall electrum. This is to prevent accidental loss of funds. When you update Electrum it automatically picks up your wallet from the default location I gave above. Not the answer you're looking for? Browse other questions tagged electrum ubuntu or ask your own question. How can I update a transaction from Electrum? How do I install Bitcoin Armory in Ubuntu 17.04?